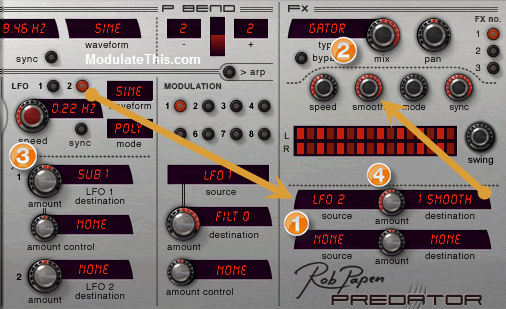 A stand out feature of Rob Papen’s Predator compared to many virtual subtractives on the market is that it allows you to modulate effects parameters via the various mod matrix slots with very few or no artifacts. I came up with a few examples below with some sample audio at the bottom of the post. You can also MIDI map these parms and modulate in real-time. One of the Gator parameters is "smooth” which allows you to round off the sharp edges of the Gate. Even cooler you can modulate smooth parameter to rotate from sharp edges to round edges. Set LFO2 as a source and set “1 SMOOTH” as destination. The “1” indicates the effect is in slot 1 of 3. Crank the “smooth” param all the way up. This smooths the gate. Set LFO2 to sine and a slow speed. Turn the modulation knob for LFO2 all the way to the left. When you press a key, the LFO will modulate the smooth param back to 0, so a squared off gate. As the LFO cycles, you’ll hear the gate smooth out. This same idea will work with effects like delay times. 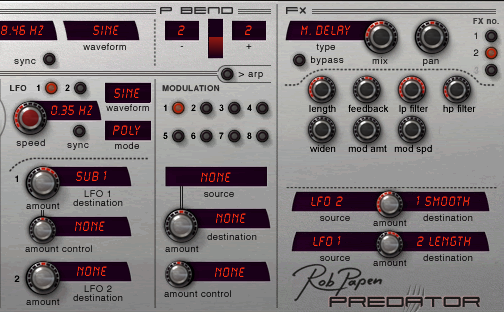 I modified this preset to use LFO 1 to modulate the delay “LENGTH” of a Mono Delay in slot 2. These are just two very basic examples to inspire you. Experiment with LFOs with different shapes at different speeds, with using different sources like envelopes or arp velocity. Also, some other synths that come to mind that offer the modulation of FX params are Alchemy, Absynth, or Zebra 2.